We are a leading Manufacturer of laboratory wall table, u shape wall table, l shape wall table, wall sink table, botany lab furniture and nano technology lab furniture from Coimbatore, India. We are the Leading Manufacturer and Exporter of Laboratory Wall Table in Coimbatore, India. 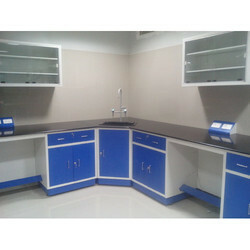 We are a reckoned enterprise, which is engaged in delivering Laboratory Wall Table to the clients. The offered range of laboratory wall tables is made utilizing optimum grade raw material and innovative technology in strict conformation with the international quality norms and standards. 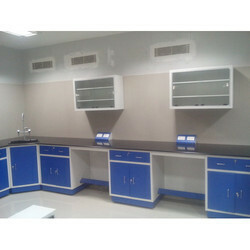 Along with this, the offered range of laboratory wall tables is known for its longer service life and efficiency. Owing to our expertise in this domain, we have been able to provide the customers with a precisely fabricated assortment of U Shape Wall Table. We are the Leading Manufacturer and Exporter of L Shape Wall Table in Coimbatore, India. Our Wall SinkTable is designed in such a way that the modules can be independent and Surdy. Entire load on the work surface will be sustained by the basic frame and not on the storage modules. 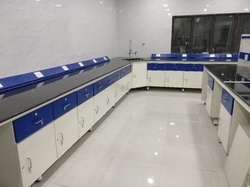 With the valuable assistance of skilled team of professionals, we are engaged in offering an extensive range of high-quality Botany Lab Furniture. 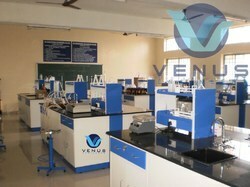 With the valuable assistance of skilled team of professionals, we are engaged in offering an extensive range of high-quality Nano Technology Lab Furniture.